I'm Davide Lovecchio, I live in Milano and I've been always interested in design, music and technology. After graduating at ITCS Pietro Verri, high school of computer science, in the summer of 2007, and after doing a lot of small jobs, i began to work for several years in the sound engineering business, thanks to my certificate in sound engineering obtained at Nuova Audio Musicmedia NAM Milano s.r.l. 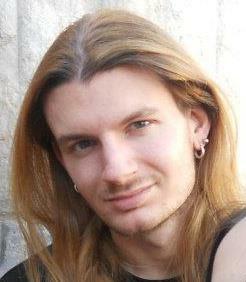 in the summer of 2010. 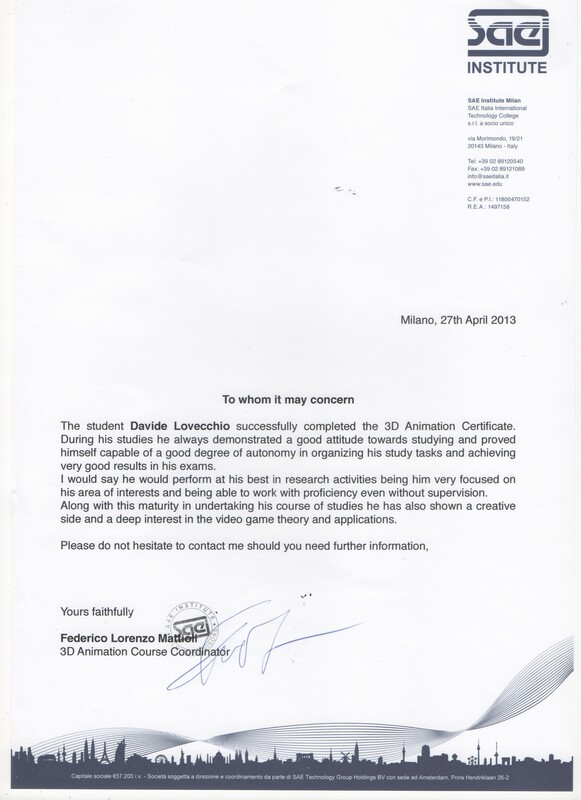 Finally, in 2012 I began to study professionally computer graphics at SAE Institute in Milano, and in 2013 I've finally obtained my certificate in 3D animation, with a reference letter that can be seen HERE, written by my teacher, 3D artist Federico Mattioli. I've spent the last years improving my knowledge on everything related to the CG field, but also i've improved my skills in programming languages, to be aware of every step in the realization of a final product, in particular, my specializations are in modelling and rigging low poly characters and static objects, draw sprites and creating assets for 3D / 2D videogames and programming their placement, control and behavior. Autodesk Maya, used for modelling, rigging, animating, creating UVs and rendering (generally with VRay or Mental Ray). Zbrush and Mudbox, used for sculpting, texturing and creating normal and displacement maps. Photoshop, used for creating or fixing textures or in post-production. Illustrator, my favorite vector graphics software. After effects and Premiere pro, used for creating every sort of effect, mounting the final video, adding the audio and post-product everything. Visual Studio, my favorite IDE for software and apps development. Monogame, used in Visual Studio environment, great framework for Windows games and apps development. Unity, used in game production, both Windows and Android. Toon Boom, for 2D animations. Dreamweaver, my favorite web development environment. Pro Tools, used for recording voices, Sound and music. C# and XAML, used in game programming, and apps development. MEL and Python, used for simplify some operations in Maya. The basic knowledge of programming achieved in my high school (mainly with C, Cobol and Pascal), gives me the skill to quickly learn other programming languages, for example currently i've just started to learn Java, and obviously improving day by day the languages that i already know. I began to study music and play guitar about ten years ago, since then i've composed and recorded a lot of music in my home recording studio, for example my original compositions, like songs or soundtrack or sound effects, but even album of other bands known in the underground scene of Milano. PS. I always answer, if not, maybe i've not recived the e-mail.